Intenzo - Dark Roast (Yellow pkg.) The newest member in the dark roast family. The beans come from the sunny mountain slopes in Guatemala, Costa Rica and grown high in Kenya. The results are an exciting full round bodied tasteful experience. Intenzo is superb for coffee drinks. Mezzo - Medium Roast (Brown pkg.) A middle roast from the dark roast specialists. This is a middle roasted coffee of the absolute highest quality. By the careful mix of high grown Kenya coffee, which is one of the worlds finest coffees, the Zoéga middle roast coffee develops an exclusive character with a certain richness. This high quality gives Zoégas middle roast a very full taste and richness. A kg (2.2lbs) is enough for 160 cups of good coffee, which is more than a regular middle roast. Blue Java (Blue pkg.) Here, where the mountains seem to appear blue on the high mountain slopes in the red volcano dirt grows the best coffee. It is from here that Zoégas has chosen its selected beans. Zoégas Blue Java is our own version of "Java" which for the native's Java means good coffee. A coffee with a nice pleasant strength, a nice wide spectrum, and a completed after taste of real coffee. Mollbergs Blandning - Extra Dark Roast (Red pkg.) Extra Rich Dark Roast. Mollbergs Roast has the highest percentage of Kenyan coffees. Because these Kenyan coffee beans mature slowly, they have a rich and smooth flavor, without any bitterness. Mollbergs Roast is then dark roasted for a smooth, gourmet dark roasted taste and aroma. 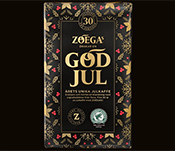 Today, Zoégas Mollbergs Roast is an authentic Swedish coffee experience. Pasión Colombia - 100% Colombian (Black pkg.) Dark roast for coffee lovers. In between the flatlands of Chocos and the Andes, on snow covered mountains, grows a coffee bean that is considered the top of the line of the Colombia coffee by coffee lovers. From these growers, we only buy the highest quality sorted beans. We dark roast with careful precision to develop the Colombia coffees elegant taste and aroma. Zoégas 100% Colombia coffee is rich and powerful with a balanced after taste. With delight you can sip on this Zoégas Colombia "au lait" another words with warm milk. Forza! (Extra Dark Roast) Is a mixture of Santos coffee from Brazil and hand-picked high-grown Arabic beans from East Africa's mountain slopes. At the coffee roastery In Helsingborg the beans are roasted extra dark to bring out a hearty and tasty coffee, with tones of dark chocolate and chili. Presso - Dark Roast (French Press - Perculator) Zoégas special coffee roasted and ground for French Presses and Perculators. A dark roasted, full bodied, and aromatic coffee with a fresh, full and unique taste. Julkaffe 2018 - Dark Roast Julkaffe means "Christmas coffee" . . . made using only the best lots of beans purchased over the year . . . the best coffee Zoégas roasts . . . available in very limited amounts. Zoégas will always and only make available coffee of very high quality. This means that the supply of available Zoégas Coffee may vary slightly through the year, and the flavor may differ a little between coffees produced and roasted at different occasions. Coffee starts at $11.00 per package.